A unique vacation is available in this 19th century two storey farmhouse named The Chicken House. Located near the town of Singhampton and close to Devil's Glen Provincial Park this large 200 acre property offers your family the opportunity to experience living in a beautifully renovated farmhouse and enjoy hiking the Bruce Trail to the Singhampton Caves, rock climbing on the Niagara Escarpment, winter sports at the Devil's Glen Country Club or visit the Mad River Gorge. The Chicken House named for it's stained glass doors decorated with roosters and other chicken decor has wide plank pine floors throughout adding warmth to the living area. The living room is spacious with high ceilings and furnished with antiques. There is comfortable seating where you can enjoy 50 channels on the Satellite TV or watch a movie on the DVD player. The large eat-in farmhouse kitchen is warm and inviting with its timberframe and tin ceilings. Enjoy preparing meals on the antique butcher block and spend quality time chatting and eating around the large dining room table. This kitchen is fully equipped with dishwasher, fridge and stove. This home has two 4 piece bathrooms that are beautifully furnished with antiques. There are four bedrooms on the second level. One queen size, 4 singles and 1 double size bed are available. All bedrooms are tastefully decorated with antique beds and period furniture. 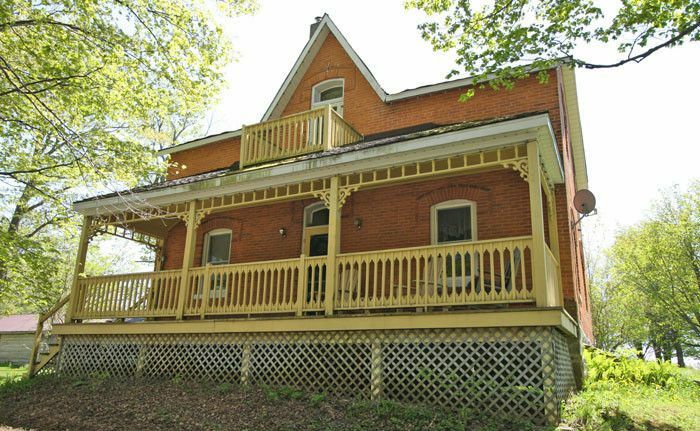 The exterior of this red brick home has a large 200 square foot verandah where you can sit in the rocking chair and enjoy your morning cup of coffee or read a good book in one of the Muskoka chairs in the shade of the verandah and its surrounding trees. Just outside the back door of the kitchen, you will find a fire pit and barbecue area where you can enjoy endless hours of story telling and roasting marshmallows. Throughout the property you will find groomed trails provided by the owner for your enjoyment. There is another smaller rental home across the driveway about 100 feet away. Collingwood is truly a gem in southcentral Ontario's crown. Greeting visitors with its brick facades and tree-lined streets, this town is situated on the Southern Georgian Bay shoreline, less than two hours north of Toronto. Home to Ontario's largest ski destination, Blue Mountain Resort is not actually atop a mountain, as its name suggests. Rather, the slopes are created by a scenic stretch of the Niagara Escarpment, also responsible for the Niagara Falls. Blue Mountain is also home to million-year-old caves and crevices awaiting exploration at the Scenic Caves Nature Adventure. Rather than sand, the shores of Craigleith Provincial Park are comprised of flat shale, some containing invertebrate fossils as old as 455 million years. In stark contrast to its other main attractions, Collingwood lures thousands to the annual Collingwood Elvis Festival, the largest of its kind outside of Memphis. Fans nosh fried peanut butter and banana sandwiches while impersonators of The King get all shook up. & $60 Accidental Damage Waiver. Located close to Devil's Glen Provincial Park, this is a great location to experience vibrant Fall colours while hiking the Bruce Trail. Within a short drive you are in the scenic Blue Mountains. Many activities are available from golfing at the beautiful Duntroom Highlands to horseback riding just 17km away. Enjoy a tour of the brewery in Creemore or walk the beaches at Wasaga Beach just 33 km away. There are several Parks and Conservation areas in the vicinity. Located close to Devil&#039;s Glen Provincial Park, this is a great location to experience vibrant Fall colours while hiking the Bruce Trail. Within a short drive you are in the scenic Blue Mountains. Many activities are available from golfing at the beautiful Duntroom Highlands to horseback riding just 17km away. Enjoy a tour of the brewery in Creemore or walk the beaches at Wasaga Beach just 33 km away. There are several Parks and Conservation areas in the vicinity. All rentals subject to a $80 process fee &amp; $60 Accidental Damage Waiver. All prices in Canadian funds. Extra person fee of 50 per person per night after the first 4 guests.